Welcome to the Crohn’s & Colitis Foundation of America Lotsa Helping Hands Community! CCFA is proud to offer this service to those affected by Crohn's disease or ulcerative colitis as part of our ongoing commitment to patients and caregivers. 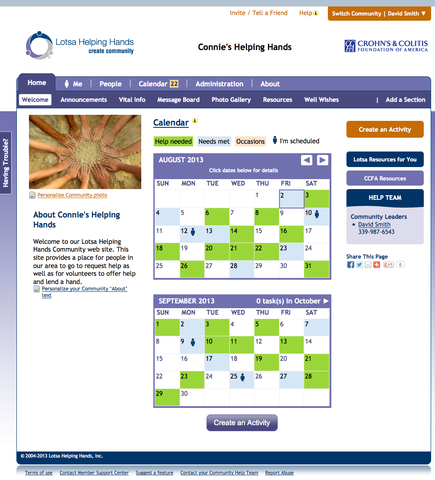 The hallmark of the service is the caregiver-focused Help Calendar, which enables members to schedule and sign up for tasks that provide respite for the caregiver including meals for the family, rides to medical appointments, and visits. Members can also communicate with one another through message boards, blogs, photos, and more.